New Book, 152 pages. 140+ B&W and colour photos, 67 colour profiles. 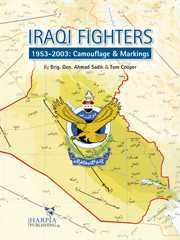 This book documents the history and aircraft of the Royal Iraqi Air Force and Iraqi Air Force. It covers the Squadron and special insignia found on the aircraft at the time, aircraft seral numbers, camouflage, service histories, air bases, and actions. The book features the following aircraft in service in Iraq: deHavilland Vampire and Venom, Hawker Hunter, MiG-17, MiG-19, MiG-21, MiG-23, MiG-25, MiG-29, Dassault Mirage F.1, Sukhoi Su-7, Sukhoi Su-20/22, Sukhoi Su-24, Sukhoi Su-25.